Note: March 5, 2014: Don't miss the comments section for research by a reader on the album owner and its signers. 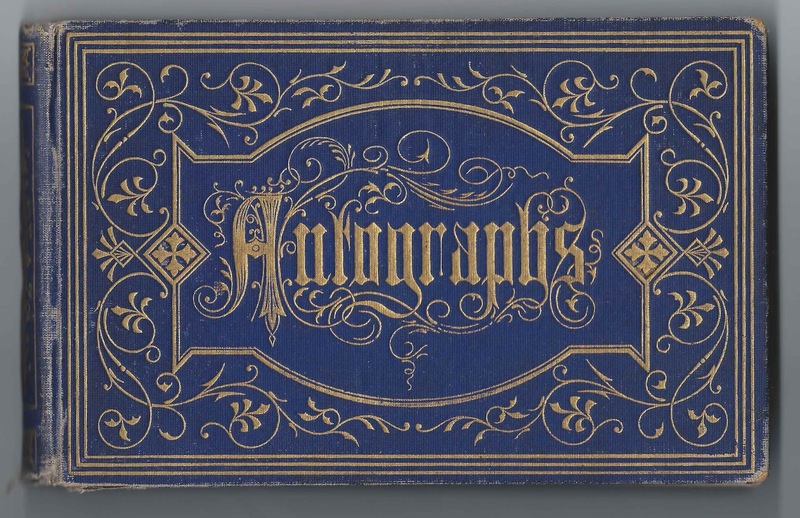 1870s autograph album of Frank of Providence, Rhode Island. 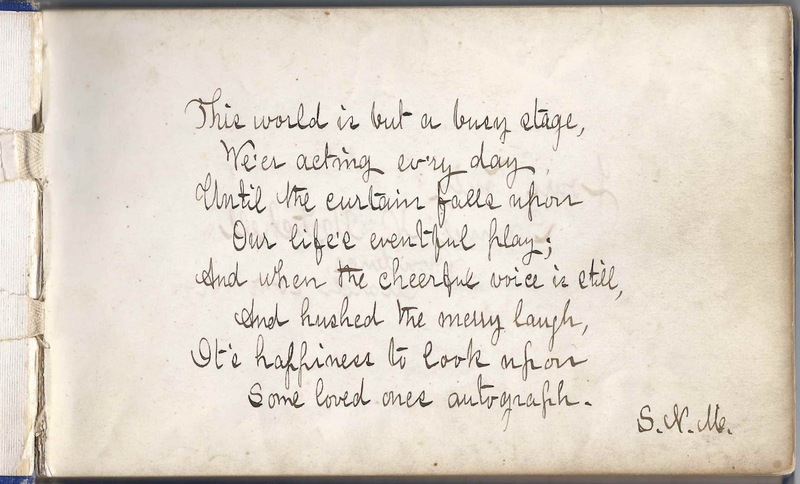 Sadly, it appears that a few pages are missing at the front of the album, including the title page and any ownership page that might have existed. Frank's mother and aunt signed, but neither wrote her name. From the ages of many of the signers, who appeared to be students, I'd say that Frank was born about 1860. It's possible that the album was presented to Frank by Samuel N. Mitchell of Providence, Rhode Island, who inscribed a page on March 20, 1874. The previous page, the first one that still exists, was signed by S. N. M. The middle initial in both instances also looks like a V, but I found a Samuel N. Mitchell living at Providence. The album is approximately 7-3/4" x 4-3/4" and contains the sentiments of 46 of Frank's relatives, friends, pastor and schoolmates. An alphabetical list of the signers appears at the end of this post. 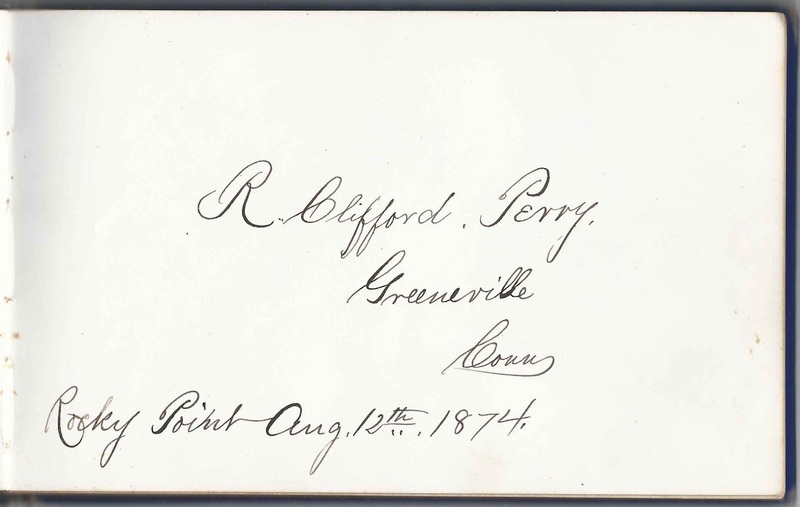 R. Clifford Perry of Greenville, Connecticut, signed a page at Rocky Point, on August 12, 1874. 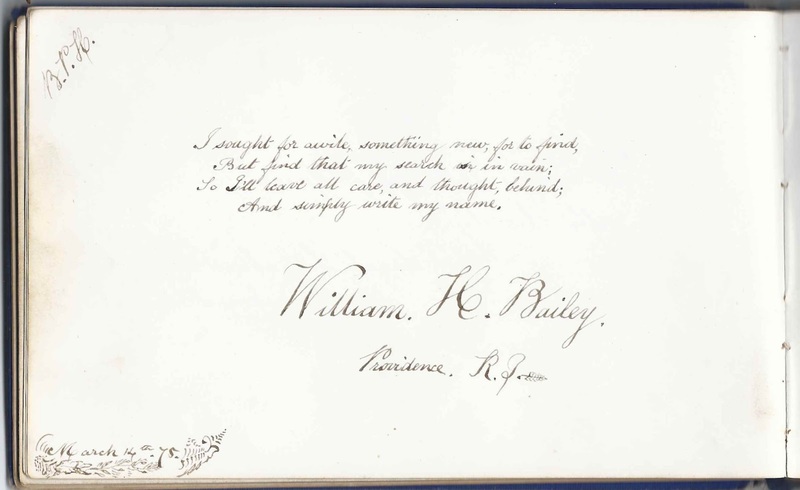 William H. Bailey of Providence, Rhode Island, signed a page on March 14, 1875 and mentioned "B.P.H. ", as did several other signers. A. E. S. or A. C. S. signed a page on August 4, 1874. 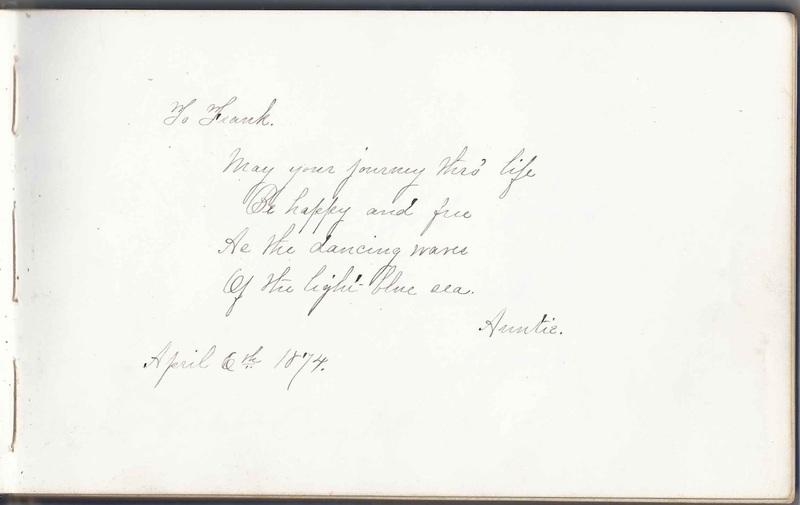 Annie Spencer Phoenix of Rhode Island wrote her name on the page vertically. 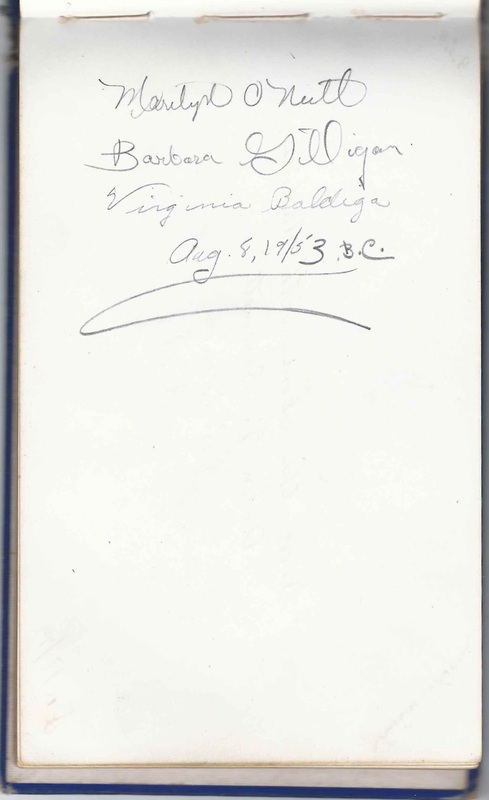 Apparently at some point the album came to light in 1953 when three women, Marilyn O'Neill, Barbara Gilligan and Virginia Baldiga wrote their names on a page on "Aug. 8, 19/53 B.C." This is the only page that wasn't signed in the 1870s. If you have a theory as to the identity album owner Frank of Providence, Rhode Island, or information on any of the signers listed below, please leave a comment or contact me directly. Thanks! William H. Bailey of Providence, Rhode Island, signed on March 14, 1875; "B.P.H." 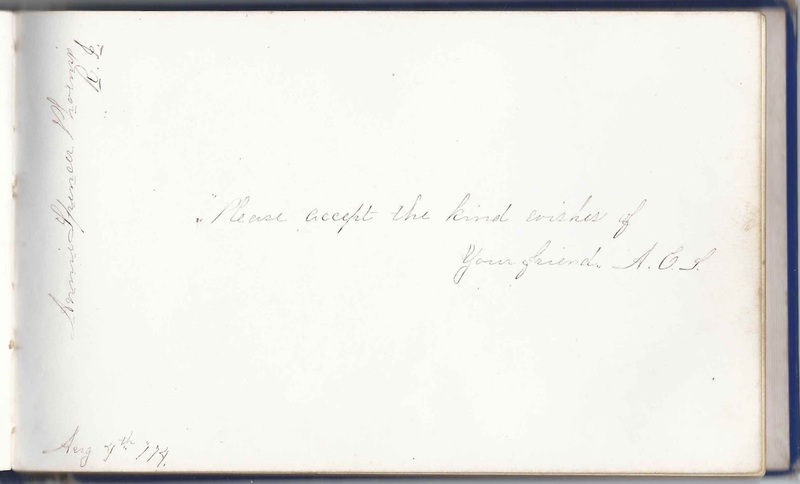 Anson F. Bennett of Providence, Rhode Island, signed on December 17, 1874; "B.P.H." Hattie E. Cady of Providence, Rhode Island, signed on March 22, 1874; "B.Y.D." Milton T. Childs, signed on July 12, 1875; "B.P.H." C. Edward Higgins of Providence, Rhode Island; "S.N.S." H. F. Manchester of Providence, Rhode Island, signed on January 2, 1875; "B.P.H." 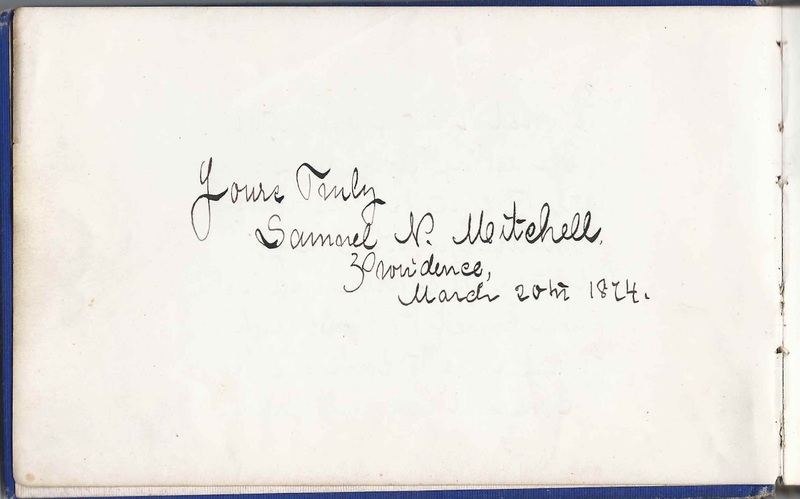 Samuel N. Mitchell of Providence, Rhode Island, signed on March 20, 1874. Presumably the S.N.M. who signed what appears to be a presentation page. 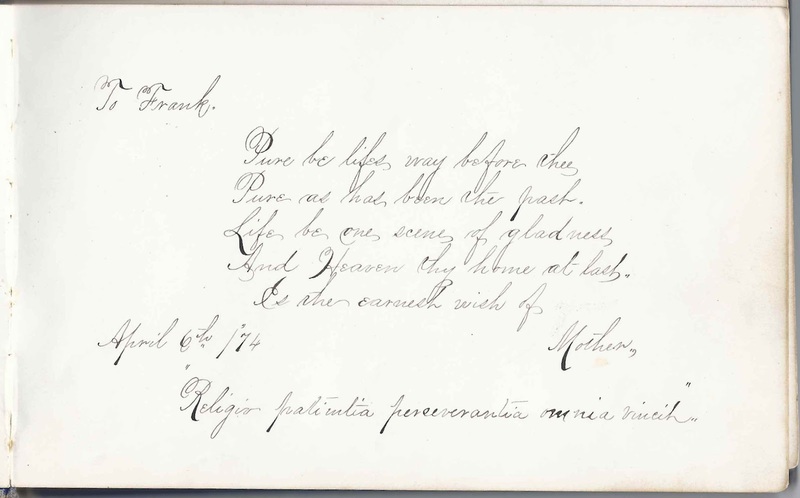 Marian J. Pomroy of Providence, Rhode Island, signed on November 18, 1874; "P.O. O.Y.T.G." Ida A. Pomroy of Providence, Rhode Island, signed on June 26, 1874; "O.Y.Y.G." Minnie F. Potter, signed at Providence, Rhode Island, on November 17, 1874. "B.P.H." Finally a Rhode Island mystery, and no surname! I wish Frank's aunt, at least, would have signed her full name. His mother maybe not, but at least his aunt. I wish I knew what those initials after the names stood for. I think your Frank had ties to the Friendship St and Clifford St area of Providence, Ward 6, and might have attended the Friendship Street Baptist Church. Maybe some of the signers were members of the church. Shubael S Parker was the pastor of that church from 1867 to 1878. It was at the corner of Friendship and Prince. He shared a two-family home with the family of one of the signers, Frank J Congdon. Prince St is no longer there but the streets intersected at 310 Friendship, which is still there. The neighborhood seems to have been cut in half by I-95. A lot of the signers lived on Friendship, Clifford or West Clifford. The ones I kept ages for were born about 1860 +/- 5 years. Samuel N Mitchell was an exception. He was born about 1847. He was working in the mail room of the Evening Press in 1875. Maybe he was Frank's mentor. I also think Frank might have been working as a clerk somewhere by 1875. Six of the men that I found were clerks, and most of them lived in that same neighborhood. One of the signers, Minnie Potter, married Isaac Goodchild, the brother of another signer, Clark Goodchild. Rocky Point was an amusement park. Maybe your "Frank" and Rozolvo Clifford Perry, born about 1855 in Greenville, Norwich, Ct, were related or knew each other from working together and met at Rocky Point on an August afternoon, 1874. I wish I could figure out how those three women in the 1950's were connected. Virginia Baldiga was in Central Fallls HS in 1956. (Her husband Richard Duprey just died in 2012 in Coventry, RI). There was a Marilyn O'Neill in Providence but she would have attended a different school. I eliminated two of the three Barbara Gilligans that I found, and I didn't find the third in the 1940 Census. Henry F Manchester, clerk for Weybossett Bank, but at 67 Vinton. The only one listed not in the immediate neighborhood. Wow - I'm in awe, Ed! I've put a note in the post for readers to scroll down to the comments section. Good news - there's more southern New England albums coming up.